Our conveniently-formatted Ephemerides and Tables of Houses are recognized internationally for their quality and precision. All are multilingual international editions with introductions in English, French, German, Italian and Spanish. Our Ephemerides are recommended by Robert Hand and numerous astrologers. The price mentioned for each book is given in Euros. Other currencies are available by clicking on the menu “Select your currency” in the top right. You may also use the following website for exchange rates: Oanda. 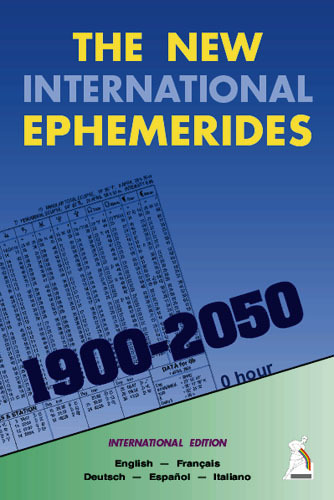 The New International Ephemerides 1900-2050 is the most popular volume among our astrological ephemerides, and is also the least expensive. It has become a main reference book for a large number of astrologers worldwide. This book is out-of-print and is no longer being published. 150 years of ephemerides in a single volume (two months per page). Longitudes of Sun and Moon rounded to one second of an arc. Planetary longitudes rounded to one minute of an arc. True and Mean Black Moon (lunar apogee) daily. True and Mean Lunar Nodes daily. Times of Direct / Retrograde stations. Times of Ingress for Sun, Moon and planets. Listed monthly: 1) Sidereal Vernal Point and Ayanamsa for sidereal astrology, 2) Chiron's longitude, 3) Delta T Time correction. To calculate an astrological chart, our Tables of Houses are an essential complement to our ephemerides. They allow to determine the position of the Ascendant and the other houses. This book is out-of-print and is no longer being published. 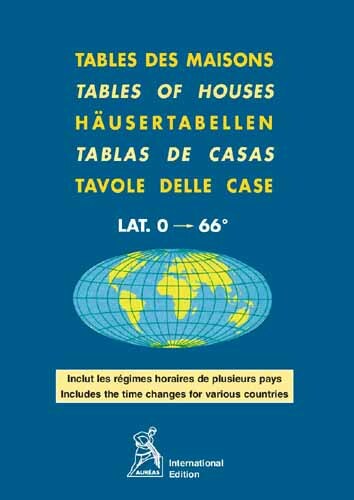 This new international edition of the Tables of Houses, calculated entirely by computer according to the Placidus method, gives for each degree of latitude from 0 through 66 all the information necessary to establish the houses and to erect an astrological chart. How to use these tables for the southern latitudes is clearly explained with an example. In the first section, this book also contains the longitudes and latitudes of 3500 major cities worldwide, as well as the time changes for several European countries.